Nikon has made a world’s first today with the Nikon 1 AW1 – a new member of the 1-series that is also the first digital interchangeable lens camera to be waterproof and shockproof. Able to operate in depths of up to 15m, shockproof from heights of up to 2m, freeze-proof to -10ºC and fully dustproof, the Nikon 1 AW1 is, the firm says, designed for ‘active people who go on adventures’. The camera features GPS and a geotagging system that can save an image’s location to its Exif data. 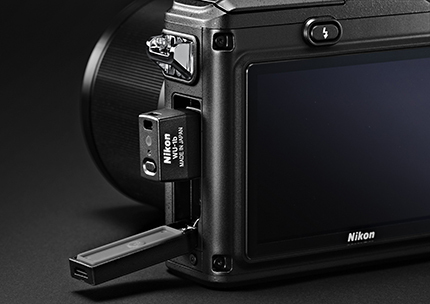 The Nikon 1 AW1 is capable of tracking depth and altitude and also features an electronic compass – another world’s first feature for a camera. The Nikon 1 AW1 offers 14.2-million pixels of resolution thanks to the CX-format CMOS sensor, and its ISO range goes up to 6400. It also includes Nikon’s EXPEED 3A processor, which allows for continuous shooting at 15fps with autofocus and up to 60fps with fixed-point AF. As befits the camera’s ‘action and adventure’ focus, a number of creative modes are included that aim to minimise the chances of missing fast shooting opportunities. Nikon refers to these collectively as ‘Best Moment Capture’. Slow View captures up to 20 continuous shots and displays them on the LCD screen, allowing the user to select the best. Smart Photo Selector is a similar concept but automated, with the camera taking up to twenty images and recommending five of the best. A new unique feature is Motion Snapshot, which records with one-click what Nikon calls a ‘living image’: a short slow-motion movie that ends with a photograph. New Creative Mode allows the user to apply filters and effects to photos before shooting, with specific underwater modes to reproduce colours from beneath the ocean. Live Image Control appears to be an intuitive way to adjust settings, providing essentially a live preview of how an image will look on the viewscreen and allowing the user to adjust the control bars until the image looks the way he or she wants. The camera’s rear screen can be put into ‘Outdoor Mode’, which brightens it and makes the options easier to see – useful for underwater shooting. Also launching alongside the camera are two dedicated 1 Nikkor AW lenses. Waterproof, shockproof and freezeproof, these lenses are specifically designed to be used in the same extreme situations as the Nikon 1 AW1. Two lenses comprise the new range: the 1 Nikkor AW 11-27.5mm f/3.5-5.6, an ‘action-loving’ 2.5x zoom, and the 1 Nikkor AW 10mm f/2.8, a fast wide-angle lens. 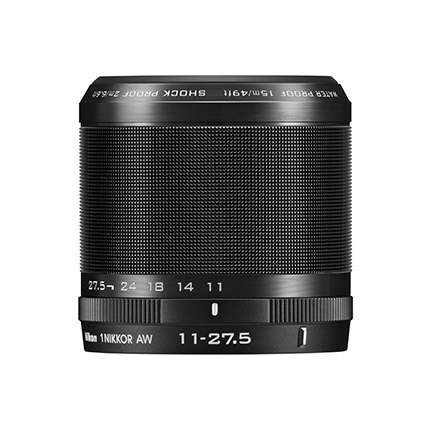 The 1 Nikkor AW 11-27.5mm (35mm equivalent 30-74mm) f/3.5-5.6 incorporates an aspherical lens element and an ED glass element. It has an extra layer of rubber sealing around its zoom ring for additional water insulation. The 1 Nikkor AW 10mm f/2.8 is adept at capturing fast action thanks to its wide aperture, and has a close focusing distance of 0.2m. Both lenses are protected from water damage, to depths of up to 15m for the zoom lens and 20m for the wide-angle. 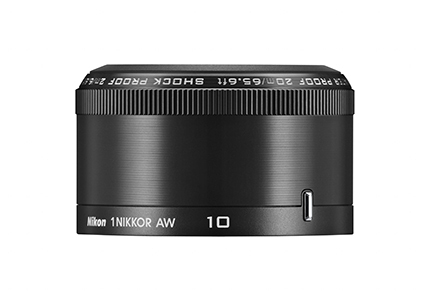 As well as the new lenses, the complete range of 1 Nikkor lenses is also compatible with the Nikon 1 AW1, and it is also possible to use Nikkor lenses with the camera, in combination with the FT1 mount adapter. 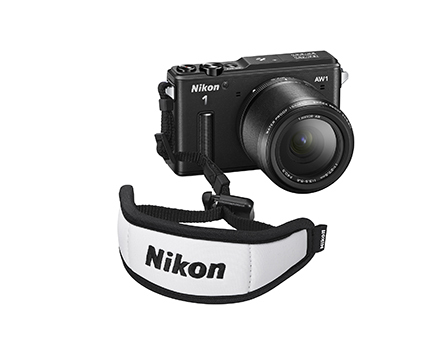 A number of accessories are available with the Nikon 1 AW1, including the AN-N3000 camera strap and the AH-N6000 wrist strap. The CF-N7000 water-resistant soft case provides a little extra grip, while the CF-N6000 silicone jacket protects the exterior surface from scratches. Nikon also announced the SB-N10 underwater Speedlight, which can be used with the Nikon 1 AW1 and is expected in Spring 2014. The SB-N10 will also be compatible with Nikon 1 underwater cases. 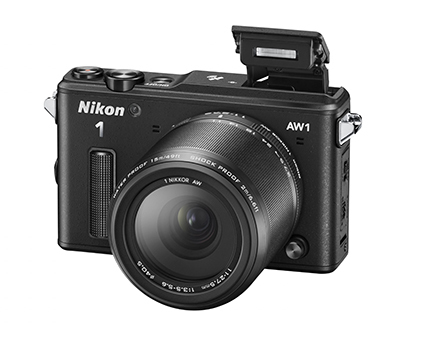 The Nikon 1 AW1 is available in silver, black and white. It will be on sale from October 10, 2013, priced at £949.99 when bundled with both the 11-27.5mm f/3.5-5.6 lens and the 10mm f/2.8 lens, or at £749 when bundled with just the 11-27.5mm f/3.5-5.6 lens.